After Happy Camp TV hosts Xie Na and He Jiong, Yang Mi is the third person in the world to reach 100 million fans on weibo. She's been on weibo since 2009 and has been acting way before that. Having a long career does not translate to popularity, but it does help in building a strong fanbase. In fact, many of the celebrities close to hitting 100m include Chen Kun, Zhao Wei, Yao Chen and Ruby Lin, all of whom have been in the industry for many years whereas newer actresses like Dilireba are at 57m followers. With her dramas often turning into hits, it's not surprising to see Yang Mi crossing over to the 100 million club. 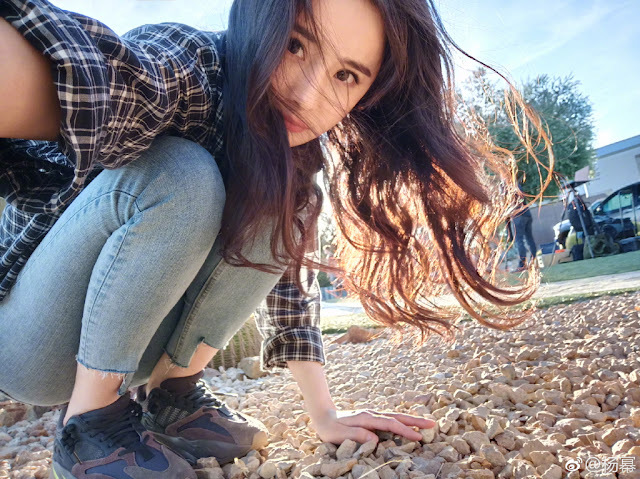 In true Yang Mi style, she shared her trademark selfies that cover up part of her face as a thank you to her fans. Her studio shared the behind-the-scenes shots. 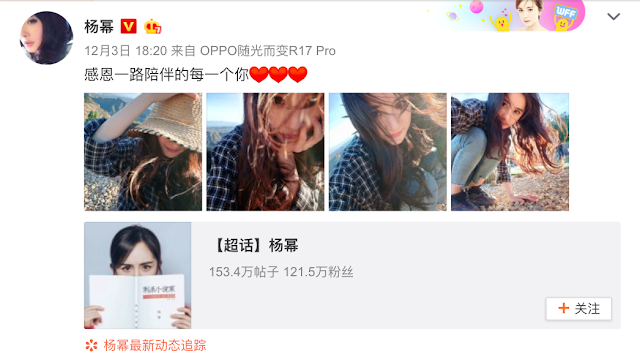 As for who's next in line, Angelababy is currently the closest contender with 98,254,077 followers on weibo. Congrats to my queen !!!! Congrats to her one of my favorite actresses.